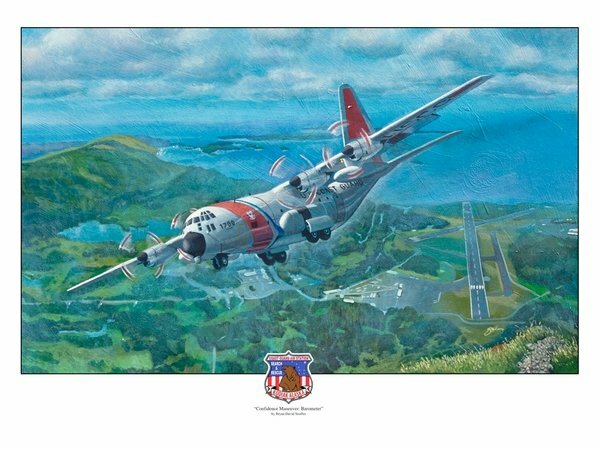 About the Painting The Confidence Maneuver at Kodiak is a pattern in which Hercules pilots maneuver the aircraft along Barometer Mountain at the west end of Runway 25. The mountain towers of the mountainous landscape on the island. Double remarque edition. Drawing are printed on and enhance with addition graphite drawing my the artist. A brand new limited edition print. 21x28", 1790 signed editions, $175.00, 100 signed artist proofs, $250.00 and 250 remarque editions, $600.00. Framing is available on 100 editions only.